Ready! Set! Go! Use the Ramps Journal while sending toys down ramps. Which one makes the toy go farther? Keep track of the results in your digital science journal. Are the toys speeding by too quickly? No problem. Record videos in slow motion! 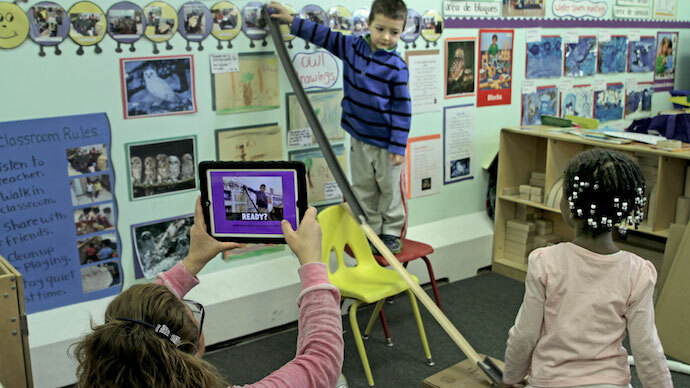 The Ramps Journal offers scaffolds for children as they document their own science experiments on force and motion. The Ramps Journal is part of a Plants curriculum supplement from Early Science with Nico & Nor™ that was rigorously researched and developed specifically for preschool classroom use. Early Science with Nico & Nor curriculum supplements combine traditional classroom activities with digital learning to promote young children’s engagement with age-appropriate science practices and concepts. Explore the Nico & Nor Early Science Teacher’s Guide! Early Math with Gracie & Friends™ and Early Science with Nico & Nor™ and the characters and related indicia are trademarks of First 8 Studios @WGBH. ™/©2019 WGBH Educational Foundation. All Rights Reserved.